80 min., not rated (equivalent of an R). An edgy visual scorcher with social-commentary aims, “Like Me” is just like its lead character: it seeks your attention but doesn’t have much to say. Speaking a similar visual language to films by Gregg Araki and Harmony Korine, and maybe a bit of Oliver Stone’s “Natural Born Killers,” the film is writer-director-producer-editor Robert Mockler’s stylistically flashy directorial debut. 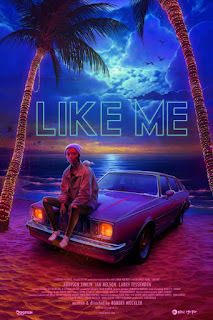 “Like Me” certainly has a hypnotic, psychedelic quality from its neon-hued aesthetic and seems to have provocative ideas for the viewer to ruminate, but what it wants to say exactly about desire for connection and validation in a desensitized social-media age is never entirely clear. There is a statement to make about the 21st century’s fixation on a desperate pursuit of mass approval and fame, or just infamy, but so many other films have left viewers with more to take away than this one ever does. 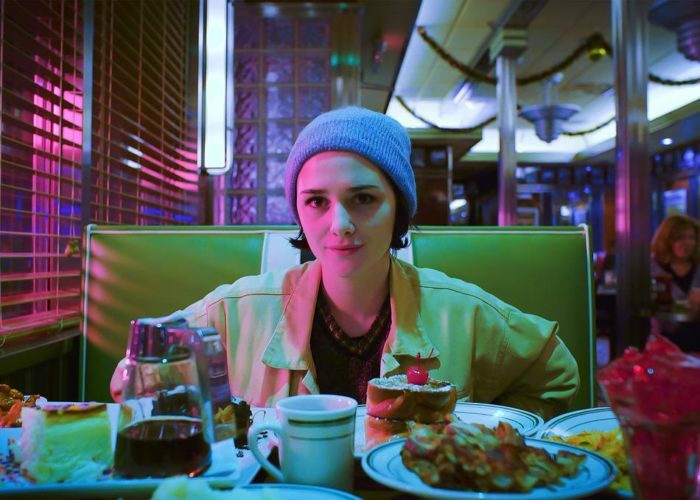 17-year-old Kiya (Addison Timlin) is an attention-starved loner who commits crimes for online views. Wearing a mask and wielding a gun, she holds up a drive-thru convenience store, making the clerk plead for his life and urinate all over himself, and records it all on her phone. Kiya posts the video online and it goes viral, garnering vehement response, particular by one video blogger, Burt (Ian Nelson), who condemns her and her content. She then picks up a homeless man and takes him to a diner to eat pancakes and plates of other messy food. Kiya then checks into a motel and seduces the owner Marshall (Larry Fessenden) into coming to her room, only to force-feed him junk food until he regurgitates it, all while uploading the footage to her site. Marshall becomes her hostage of sorts, as the two of them embark hit the road, but how far will Kiya go to gain more than a million page views? 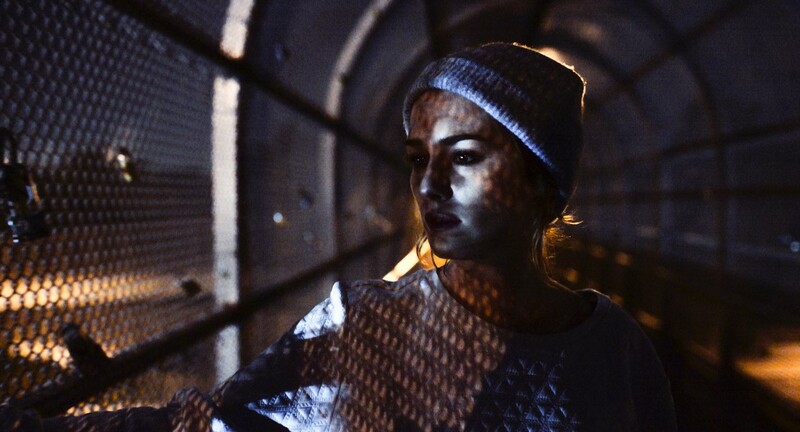 Indebted to experimental cinema, “Like Me” is unconcerned with being a traditionally plot-driven narrative, but it doesn’t really work as a fascinatingly harsh character study in alienation. Disturbing in not only what it shows but what it suggests about an extreme representative of the millennial generation, the film mostly amounts to 80 minutes of video performance art that becomes an abrasive endurance test before the halfway mark. With her sweet face masking her character’s delusional, disturbed psyche and evasive intentions, Addison Timlin (2014’s “The Town That Dreaded Sundown”) pushes herself to dark, weird and daring places as Kiya and exercises power over every person she comes in contact with. She doesn’t have to be a warm, likable and morally just protagonist to be compelling to watch, but it does become a problem when there aren’t any other layers to reveal about the sociopathic Kiya, who remains a blank if capably dangerous cipher rather than an aloof character worth our concern. She aims to shock and that is about it. Even when Marshall (played by a vulnerable Larry Fessenden, who looks like Jack Nicholson here more than ever) asks if she has any family, Kiya replies, “Everybody dies,” and then changes the subject. As Kiya and Marshall go on the road, filmmaker Robert Mockler would seem to be heading his story in directions that might surprise, startle, or shed insight into these characters, but “Like Me” dwindles to nothing but the only kind of catharsis Kiya can inevitably attain after all of her transgressions. 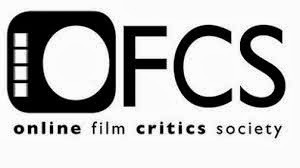 If the film impresses in any way, it is Mockler’s technical eye. Following the opening gun-point robbery, Mockler stages a dizzying, discordant montage of fast-paced, twitchily edited images on a loop, focusing on Kiya doing push-ups as her entire bedroom is stuck in a state of constant rotation and then cutting to her mouth chewing on candy that oozes through her teeth, until she eventually vomits on the camera lens. It’s arresting and repellent all at once, with a quick nod to David Cronenberg's "Videodrome," and the squishy sound design of eating and slurping food is effectively disgusting that those who are so inclined will definitely not want to view this on a full stomach. Then again, once the film proves to have little else to recommend it, even those disorienting visual flourishes turn tiresome, indulgently artsy and seizure-inducing after a while. Mockler still stands as a filmmaker to watch, but “Like Me” feels like a lot of empty, assaultive style with ideas that are left unexplored.